With cold and flu season in full force, sick days at school are on the rise. But sometimes a child’s symptoms might not be strong enough to know for certain whether a sick day is necessary. When kids wake up not feeling well, parents often have to make a quick judgment call on whether their child is too sick to go to school. A variety of factors play into the decision-making, including logistics and fears that the illness could spread or worsen. Last January’s Mott Poll report asked parents of children 6-18 about how they decide whether or not to keep their sick child home, or send them to school. Three-quarters of parents said their child had at least one sick day in the past year. 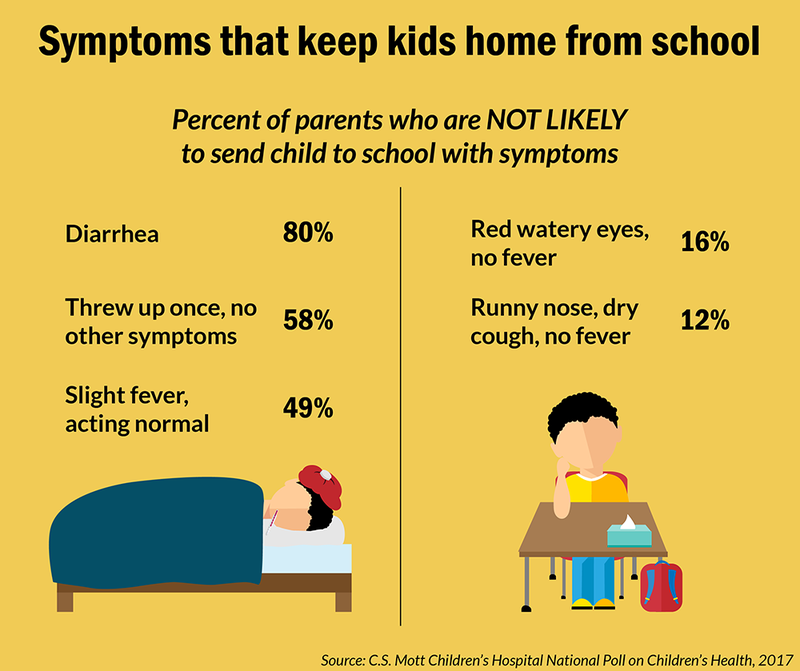 18% of parents said not being able to find someone to stay with their sick child is a very important factor in deciding whether or not to send them to school. The top factor in parents’ decision-making to keep a child home from school is that the illness could get worse. About half of parents (49%) were not likely to send their child to school if they had a slight fever, but were acting normal. With the severity of this year’s flu season, parents may want to exercise caution when deciding to send their child to school if they think they might have flu symptoms. If you or your children haven’t received a flu shot this season, the CDC is still recommending vaccinations throughout the flu season.